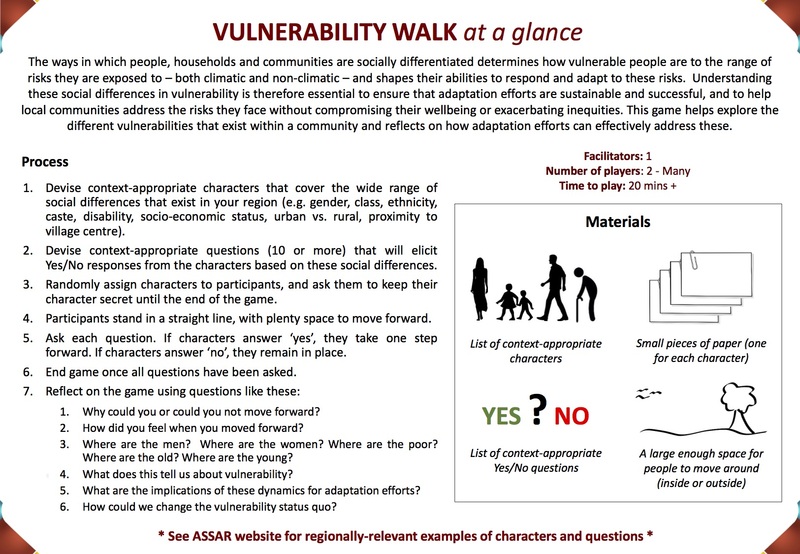 The vulnerability Walk - at a glance. Click to enlarge. The ways in which people, households and communities are socially differentiated determines how vulnerable people are to the range of risks they are exposed to – both climatic and non-climatic – and shapes their abilities to respond and adapt to these risks. Understanding these social differences in vulnerability is therefore essential to ensure that adaptation efforts are sustainable and successful, and to help local communities address the risks they face without compromising their wellbeing or exacerbating inequities. This game helps explore the different vulnerabilities that exist within a community and reflects on how adaptation efforts can effectively address these. Devise context-appropriate characters that cover the wide range of social differences that exist in your region (e.g. gender, class, ethnicity, caste, disability, socio-economic status, urban vs. rural, proximity to village centre). Devise context-appropriate questions (10 or more) that will elicit Yes/No responses from the characters based on these social differences. Randomly assign characters to participants, and ask them to keep their character secret until the end of the game. Participants stand in a straight line, with plenty space to move forward. Ask each question. If characters answer ‘yes’, they take one step forward. If characters answer ‘no’, they remain in place. End game once all questions have been asked. Why could you or could you not move forward? How did you feel when you moved forward? Where are the men? Where are the women? Where are the poor? Where are the old? Where are the young? What does this tell us about vulnerability? What are the implications of these dynamics for adaptation efforts? How could we change the vulnerability status quo?